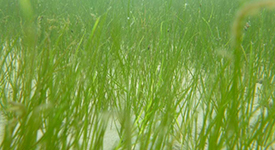 An annual survey led by researchers at the Virginia Institute of Marine Science shows that the abundance of underwater grasses in Chesapeake Bay increased 21% between 2014 and 2015, an upsurge from 75,835 acres to 91,621 acres, which represents the highest total of the last 3 decades and just under half of the baywide 185,000-acre restoration goal. VIMS tracks the abundance of underwater grasses as an indicator of Bay health for the Chesapeake Bay Program, the federal-state partnership established in 1983 to monitor and restore the Bay ecosystem. The latest values are the highest ever recorded by VIMS aerial survey and surpass the partnership’s 2017 restoration target 2 years ahead of schedule. VIMS researchers estimate the annual acreage of underwater Bay grasses through aerial surveys flown from late spring to early fall. For 2015, the VIMS team continued the practice— first introduced in 2013—of categorizing abundance using 4 different salinity zones, which are home to underwater grass communities that respond differently to storms, drought, and other adverse growing conditions. Reporting grass abundance by salinity zone makes it easier for scientists to connect changes in grass communities with changes in growing conditions through time. Orth and other experts attribute the latest rise in underwater grass abundance to the recovery of wild celery and other species in the fresher waters of the upper Bay, the continued expansion of widgeon grass in the moderately salty waters of the mid-Bay, and a modest recovery of eelgrass in the very salty waters of the lower Bay. In spite of the good news, experts advise cautious optimism: because widgeon grass is known as a “boom-and-bust” species whose abundance can rise and fall from year to year, the widgeon-dominant spike is not guaranteed to persist in future seasons. 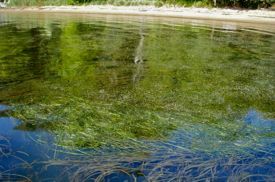 Freshwater grasses, however, are more resilient, and continued improvements in water quality are expected to support the continued expansion of these grass species. The Elk River. Grass beds in the Elk River suffered a severe crash after Hurricane Irene and Tropical Storm Lee hit the region in 2011. In 2015, the grass beds in this northeastern Maryland river were on track for a full recovery. While b​eds were not as dense as those seen in the river in 2010,​ field observations showed that some were larger and more diverse than previously observed and surpassed the river’s restoration target. Wild celery, whose seeds pods and roots offer food to migrating waterfowl, was the dominant species detected. The Choptank River. ​Although SAV abundance in the Choptank River also decreased significantly from 2011 to 2012, aerial imagery revealed 4,000 acres of grasses in the waterway by 2014​. By 2015, this number increased 50% to 6,000 acres. The VIMS aerial ​survey also revealed a small, never-before-reported band of underwater grasses in the tidal freshwater portion of the river last summer. Fresh waters (the Tidal Fresh Salinity Zone) has ranged from 6,900 acres (1995) to 25,481 acres (2008), averaging 12,662 acres. Between 2014 and 2015, bay grass abundance in this zone increased 1,959 acres to 17,454 acres, achieving 85% of the zone goal. Slightly salty waters (the Oligohaline Salinity Zone) has ranged from 653 acres (1984) to 13,919 acres (2005), averaging 6,800 acres. Between 2014 and 2015, bay grass abundance in this zone increased 2,681 acres to 9,881 acres, achieving 96% of the zone goal. Moderately salty waters (the Mesohaline Salinity Zone) has ranged from 15,636 acres (1984) to 48,444 acres (2005), averaging 28,784 acres. Between 2014 and 2015, bay grass abundance in this zone increased 10,680 acres to 47,728 acres, achieving 40% of the zone goal. Very salty waters (the Polyhaline Salinity Zone) has ranged from 9,959 acres (2006) to 24,016 acres (1993), averaging 17,772 acres. Between 2014 and 2015, bay grass abundance in this zone increased 862 acres to 16,558 acres, achieving 49% of the zone goal. A stacked column 2D chart will load here!